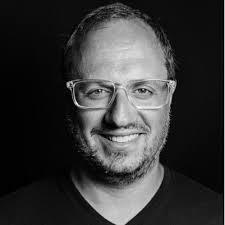 Geoffrey Colon is the voice at the intersection of marketing, tech, and popular culture. Thinking is his commodity. DJ, data punk, podcaster and author, Geoffrey is a Communications Designer at Microsoft in Redmond, WA, for Microsoft search advertising (Bing Ads). Colon has written for or been quoted in various publications and media outlets including Fast Company, The Huffington Post, The Guardian, Wall Street Journal, Billboard Magazine, Advertising Age, Digiday, Branding Strategy Insider, Entrepreneur and The Los Angeles Times. He has also appeared on NPR, Cheddar TV and NASDAQ Live. He is an avid speaker on the global marketing conference circuit. Prior to joining Microsoft in 2013, Geoffrey was vice president of digital strategy at Ogilvy & Mather in New York City. Geoff resides in Kirkland, WA, with his wife and two daughters after spending over two decades in Brooklyn, NY, and Maplewood, NJ. His first book, Disruptive Marketing: What Growth Hackers, Data Punks, and Other Hybrid Thinkers Can Teach Us About Navigating the New Normal, was published by AMACOM (2016). Before discussing Disruptive Marketing, a few general questions. First, who has had the greatest influence on your personal growth? How so? It has to be my parents. Both had PhDs and wanted me to get as much formal education as possible. My father was an urban politics professor and always had conversations on how immediate actions have long-term consequences. He was into behavioral economics back in the 1970s long before Richard Thaler popularized the discipline. I think that’s what has drawn me to strategy. Strategy is a combination of factors including behavior, society and policy. My mom was a psychologist so everything is rooted in behavior, much of it irrational. The issue I think that has existed in business for decades is it applies rational economic thinking to an irrational people-behaving world. I like the hybrid of both disciplines and think to be successful in the 21st Century you need both. David Brooks who is SVP of Digital at Ogilvy. Like my parents David is a long-term sustainable thinker. He thinks of crazy ideas that he then makes happen. Most of my best talks have been with him and we have executed some amazing work for clients as a result. Also my first boss Kelly Schweinsberg at BMG. She was the hardest working person in the world and taught me relationships will always matter in business. I was working in the music industry and realized not one of these overpaid senior record label executives understood MP3 technology. I’m this 27-year-old marketing exec that starts asking what if questions they didn’t even want to bother to think about. I’ve always been drawn to business transformation scenarios as a result. I always ask and answer what is next for business and try to help people get there. It’s difficult for most to see the future while operating in the present. Journalists ask questions so they understand things. This of course isn’t limited to the role of journalism; we find this in many fields of science. But as a journalism major at a heavily scientific rooted university it became natural to ask lots of questions with a scientific method pattern that makes it almost design thinking in approach. I would say my university experience prepared me to be a design thinker. Some people aren’t intelligent but get senior leadership roles due to loyalty. The business world is like the Game of Thrones. Filled with politics, kings, queens, power struggles and B.S. It’s no meritocracy and some of the best people who do great work get nothing but swallowed in its chaos. I’ve tried to do less internal politicking over my career and more external outreach. The corporate ladder is a terrible path to travel whether it’s in academia as tenure or for a promotion to partner. Most people who have these titles aren’t always good at what they do but instead make no mistakes and are loyal. As a result they are hardly innovative thinkers. The Big Short. A bunch of outsiders asking questions and being told they were all crazy for betting against a proven system. Every entrepreneur does this and we only glorify them when they are successful. Otherwise we treat most like villains. All things start with people. But business overshadows this for systems and efficiency. They always try to automate or dehumanize the world. This is why so many young people like startup culture, one that’s trying to rebel against dehumanization and making people operate like software into making people operate like people. The best leaders make people shine, not systems. I remember my dad saying I needed to try and fail in life so I would learn what not to do. It has stuck with me when I approach strategy. What should we not do is as important as what we should do and we may not be able to answer this without trying several things to figure out the riddle. Look at politics. How people do not believe in science is beyond me. How people in business think they are immune from politics seeping into business is beyond me. Everything today is interconnected. There is no divide between work and life, business and politics. People don’t question enough because critical thinking is frowned upon. We are not an intellectual society. I mean look at the recent U.S. Presidential election. We think smart people are those who’ve earned the most wealth. I know a lot of wealthy people and they’re not smart. Not looking at or asking maybe how those people acquired their wealth in the first place is how we begin to reward based on vanity metrics. Meanwhile we put scientists in the doghouse. We dehumanize teachers. What makes a corporate CMO any better than a teacher? Most CMOs are terrible at what they do. Most are lazy thinkers based on how they plan and manipulate perception. We need to get to a world where critical thinking is the acceptable norm. Critical thinking shouldn’t just be used in science to make decisions but in everything. When I analyze weird data my leadership hates that it exists but I’m always curious as to why it exists. What caused it? If we only live once, why are we so lazy in asking the hard questions of the world? Everyone can think of big ideas but not everyone can make those big ideas into reality. Execution is your best form of strategy. I hate process efficient people who think linear. That’s what software is for and it ultimately will replace box-checking people in the workplace. Recently I was setting up a marketing automation system for Microsoft and it was the least creative thing I’ve done in my life. Will it make people more efficient? Yes. Will it make them more creative? Nope. I’d be curious to ask Virginia Satir a lot of questions on how she diagnosed the changing family dynamic into change management scenarios for business. Firstly, the work she did was amazing and still used today but secondly, change management is an area that business management philosophy is poor at. People do not like change but it is inevitable. I hate traditional business gurus so there’s no way I would ever want to sit down with one. There’s less to learn from them as there is from people in fields of study that have little to do with your own. Force yourself to do things that cause discomfort in your personal life: run a marathon, learn coding, write a book, raise a child, listen to music you’ve never heard, travel to distant lands. These actions force you put of your comfort zone and make you realize change isn’t all bad. Being more transparent in an age of information. Most do decision making behind closed doors but that’s not reality anymore. When you have a president-elect who can tweet and bring a company’s share price down as a result, doing things the old fashioned way is a death sentence.